The function module ‘READ_TEXT’ allows us to read standard text. For example, let say you want to use the FM ‘READ_TEXT’ to retrieve a specific text from a sales order. The first thing to do is to find the appropriate parameters to pass to the FM to retrieve that specific text. 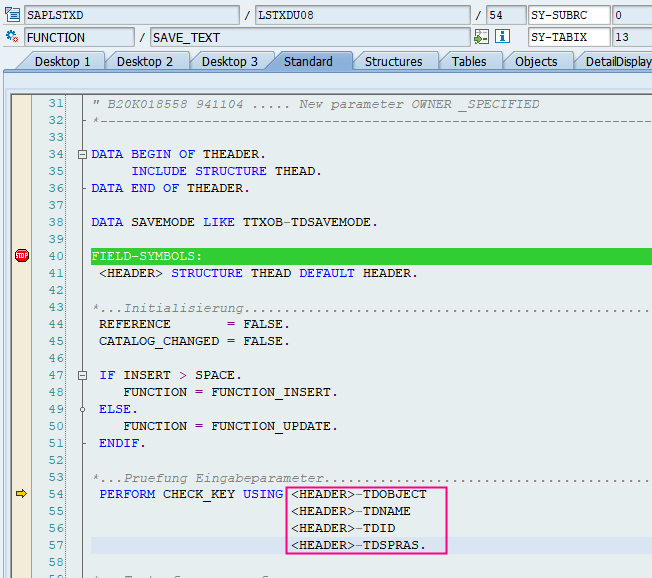 Thus, modify the sales order in VA02 and enter some text in the field you want to read the text. Activate debugging mode (/h) and save the sales order. In debug, create a break point on the function module ‘SAVE_TEXT’. Once the appropriate parameters have been found, pass them to the FM ‘READ_TEXT’ and read the required returning text. Please find below a sample code. REPORT ZREADTEXT. *&--------------------------------------------------------------------&* *& Program Description: &* *& ----------------------- &* *& This demo program demonstrate how to use the function module &* *& 'READ_TEXT' to find standard text. &* *& &* *& Author: ABAPCOOKBOOK &* *& Website: www.abapcookbook.com &* ************************************************************************ DATA: lv_output_text TYPE char50. *Subroutine using the FM 'READ_TEXT' to return *the appropriate standard text. *Please Note: To find the required parameters (for example a text in *a Sales Order), in VA02, enter some text in the field in question, *enable debugger(/h) and put a break point on the function module 'SAVE_TEXT'. *All appropriate parameters will be available in the field symbol '<HEADER>'. PERFORM f_read_text USING 'ABCD' " Text ID 'E' " Text Language '12345678' " Text Name 'VBBK' " Text Object CHANGING lv_output_text. " Return Text *Display the standard text. WRITE lv_output_text. *----------------------------------------------------------------------* * Sub routine to read text from standard transactions using the * * function module 'READ_TEXT'. * *----------------------------------------------------------------------* FORM f_read_text USING pi_textid TYPE thead-tdid pi_language TYPE thead-tdspras pi_name TYPE thead-tdname pi_object TYPE thead-tdobject CHANGING pc_output_text TYPE char50. *----------------------------------------------------------------------* * Local Data Declarations. * Internal Tables. DATA: lt_lines TYPE STANDARD TABLE OF tline. * Field Symbols. FIELD-SYMBOLS: <fs_lines> TYPE tline. * Clearing field to be on the safer side. CLEAR pc_output_text. CALL FUNCTION 'READ_TEXT' EXPORTING id = pi_textid language = pi_language name = pi_name object = pi_object TABLES lines = lt_lines EXCEPTIONS id = 1 language = 2 name = 3 not_found = 4 object = 5 reference_check = 6 wrong_access_to_archive = 7 OTHERS = 8. IF sy-subrc EQ 0. * Getting the text from the FM table. READ TABLE lt_lines ASSIGNING <fs_lines> INDEX 1. IF sy-subrc EQ 0. * Standard text. pc_output_text = <fs_lines>-tdline. ENDIF. ENDIF. ENDFORM. *enable debugger(/h) and put a break point on the function module 'SAVE_TEXT'. *All appropriate parameters will be available in the field symbol '<HEADER>'. lt_lines TYPE STANDARD TABLE OF tline. * Clearing field to be on the safer side. * Getting the text from the FM table. Easy! 🙂 Hope it helps.